A quick and easy grilled dinner, Grilled Shrimp and Asparagus with Bang Bang Sauce is packed with flavor and a kick. It comes together in minutes, grills up in minutes, and is on the table in… MINUTES! I can’t believe #BBQWeek is over! Can you? These events always fly by so quickly. Now it’s planning and preparing for next year. Yes. Sometimes I try to plan a few recipes throughout the year. However, that didn’t work out so well this year. We had more sponsors!! Sponsors always make the event more interesting and exciting. Sometimes you really don’t know what they’re sending and you have just sort of wing it sometimes! Of course that wasn’t the case with this event. We received really delicious products to grill with this week. And there’s plenty of products to continue using throughout the year. Michigan Asparagus is a great supporter of bloggers and social media influencers. They participated and sponsored Brunch Week and BBQWeek. Which was pretty much back to back. So, when asparagus was finally ready to be picked, I received like 4 pounds of it. The hubs is in heaven, for sure! I wish I loved asparagus as much as he does. Heck, I just wish I liked it. Alas, I do not. And I feel really bad that I don’t. Michigan Asparagus is so supporting and generous. I feel like the last I could do is like asparagus. But, I keep trying and I keeping eating pieces here and there in hopes that something will change. Either way, the hubs is still in heaven. Because he loves asparagus! I don’t know why shrimp and asparagus came to mind this year. Sometimes, I never really know how my mind works with recipes and planning for events like this. I just know that whatever I was cooking it needed to be on a skewer. To go along with my kabob and taco theme. Still not sure how that came about, but it did. Originally I was going to make a teriyaki glazed Hawaiian pork kabobs. But I was a slacker on getting my Not Ketchup. I thought I had some still in the pantry but I guess I used it all. So, then I had to rethink that idea. But I stuck with the kabob/skewer idea. Then Ellen and I were chatting about what to do with the asparagus. Someone was already doing a pasta salad. I pitched an idea I might try for next year which lead to another idea I might try for next year with asparagus. I suggested a grilled pizza, but someone was doing that this year, too. Then I think she mentioned something about shrimp and asparagus and that might be where this idea came from. Oh. I just had ANOTHER idea! Maybe I’ll try this one for the burger event that’s going on next year. Then I thought about the Turkapple Burgers with Yumback Sauce I made and it got me thinking about the sauce. I wanted to make a sauce to dip the shrimp in. Of course, what comes to mind? Bang bang shrimp. Is it still all the rage? Sometimes I feel like I’m totally out of it as far as trending food topics. Then sometimes I just don’t really care and do what I want to do. I’m so on the fence. I just hope I don’t fall off. I think at this point, I need to show some more love for Michigan Asparagus. Even though I’m not a huge fan of asparagus in general, I do find that theirs is more tolerable than your garden variety. I ate the Hash Brown Crusted Denver Quiche with Asparagus. And I ate a few of the floret (is that what you call the end of an asparagus?) ends of the grilled asparagus. It wasn’t completely gross. Yes, this is my way of showing them some love. I don’t think you realize the level of dislike I have for this vegetable. So, for me to even put it in my mouth, taste it, and not completely spit it out or wash it down with tea is pretty damned amazing. So, if I can tolerate it to that extend, than it must the best asparagus in the WORLD!! See what I mean? Doesn’t that just look totally delicious? That bright green color, those tender shrimp; they all make for a quick and delicious meal. You can’t deny that! Now, the hubs was concerned that the asparagus wasn’t going to be cooked enough considering the shrimp would take minutes per side to cook. I, on the other hand, was not worried. I knew that asparagus would just turn to mush if it was overcooked. The cooking time for the shrimp allows the asparagus to be perfectly crisp tender! Just the way I like it! Now I get to show Not Ketchup some love! I can honestly say that I have tasted and created something with every one of her flavors! Spiced Fig Not Ketchup – I know I made one but I can’t seem to find it right now. Yes, some of these recipes go back a ways. And that’s all thanks to Camilla. She hosted a few events that I was lucky enough to participate in. I received many of Erika’s delicious sauces for these events. Along with some delicious duck. I wonder if we can get them to sponsor this next year. That might be epic! But, let’s get through this year first, right? Not Ketchup has amazing flavor. You can really taste the fruitiness of the ketchup in the Fruit Chup. That’s the latest flavor and I have got to say, it’s a new favorite! I’m totally using it for fries, burgers, hotdogs; you name it! It’s my new fave “ketchup” so to speak. It adds the perfect balance of sweet and tomato in this kicked up version of bang bang sauce. I have to say this is a simple sauce that would go well with anything; not just shrimp! I’m thinking chicken tenders, on a burger or hot dog, tossed with wings. Oh yeah. You’re going to want to keep this sauce around for all kinds of reasons. And Not Ketchup makes it even better! The Fruit Chup has such great flavor over its counterparts! And I love that Not Ketchup is gluten-free, vegan, Whole30 friendly, and low carb. That’s great for Dad! Who only eats low/no carb. So, for those on that keto diet, here’s a sauce for you! I can’t believe barbecue week is over! It’s FLOWN by! But, I have some delicious recipes pinned for later on this summer when we really fire up the grill! What were some of your favorite recipes? Make sure to add a few from the bloggers today. And don’t forget to enter the giveaway! To give you a head start, here’s Michigan Asparagus and Not Ketchups social media links. Be sure to follow them for delicious recipes, tips, and new products! A quick and easy grilled dinner, Grilled Shrimp and Asparagus with Bang Bang Sauce is packed with flavor and a kick. Thread the shrimp and asparagus onto skewers and grill 2 to 3 minutes per side. Combine the remaining ingredients in a mixing bowl and serve with the grilled shrimp and asparagus. 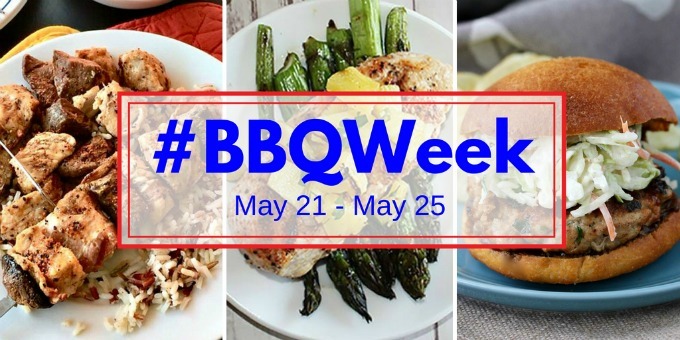 The #BBQWeek giveaway is open to U.S. residents, age 18 & up. There will be three winning entries that will be verified. The prize packages will be sent directly from the giveaway sponsors. The #BBQWeek Bloggers are not responsible for the fulfillment or delivery of the prize package. Participating bloggers and their immediate family members cannot enter or win the giveaway.No purchase necessary. Void where prohibited by law. This promotion is in no way sponsored, endorsed or administered by, or associated with social channels mentioned in the #BBQWeek posts or entry. Thank you! It is delicious, for sure! I’ve never tried Bang Bang sauce, looks like it will be great with so many things! For sure! It’s like kicked up mayo. I bet that sauce would be good with crispy onion petals. You know, you might like asparagus done up in a batter too, then dipped in the sauce. I know I would! I have legit tried asparagus every way possible. That and salmon. Just don’t like them. This looks so amazing! And that sauce!! YUM! 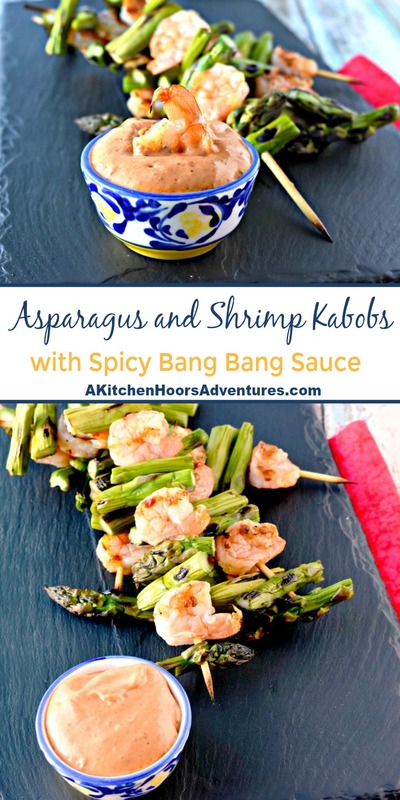 Oh how I love bang bang sauce and I love how you used it in this recipe! OMG These look so good!